How many times have you tried to pick an object that was underneath another object? Some times it's not so easy, especially if you have several objects in a busy area. Solution: Start your command (move, copy, delete, whatever). Place your cross hair over the desired object (or stack of objects). If you can't select the proper object, press the shift key and spacebar (Shift+Spacebar) simultaneously to toggle through the stacked objects. When the object you want is highlighted, pick it and you are on your way. If you need to open the Tool Pallets pallet, Properties Pallet, Design Center, Sheet Set Manager, or one of several pallets in AutoCAD, here is a guide to use. Simply Press the Control Key (ctrl) + (a number key) to open or close specific pallets. It helps to spend less time looking for the button, ribbon panel, or menu when your most frequently used pallets are but 2 keystrokes away. You might ave noticed that I have had some post's that were not CAD related, they were OFF TOPIC. This one is about the fantastically popular game, Guitar Hero. If it is getting you frustrated, upset, and you can't get the hang of, then here is a way you can "cheat" at guitar hero. Just create your own robot that can see the screen, interpret the chords and play them perfectly, every time. I came across the article on Wired.com and wanted to share it with you because I thought it was interesting, clever, and shows how people can take a normal every day toy and geek it out. The November/December 2008 issue of AUGIWorld magazine “It’s Your Move: Strategies for Adopting New Technology” can be downloaded from the AUGIWorld main page on AUGI.com. AUGI’s official monthly email newsletter “AUGI HotNews - November 2008” hits the streets and the ‘inboxes’ of its members. My favorite of course is this month's TIPniques: DO YOU HAVE STYLE? Wonder why I like it so much? Here is a list of some of the other articles in this month's edition. They are even better than the TIPniques article. TIPniques: Do You Have Style? The End of the Print Version - Going Fully Digital? Eventually we will not use paper for our news or magazines, but use the internet or wifi or cell phone type technology. It could even be a new fangled type of data transmitting tech. The exact how and what is not important, just that it will happen. Paper cost money. Printing on paper costs money. Delivering those prints on paper costs money. The way to get around that is to create a means of trnasmitting your letters, articles, magazines, news, blogs, and more is to transmit it digitally. There are so manu advantages to doing this, and disadvantages too. Every reader must have a device that can read your digital articles. On print, all they need is their eyes. Those come cheap (realatively speaking.) Is it fair to expect everyone to have their own "Kindel" or similar device to be able to read a magazine or newspaper? Sure it is. Life's not fair. Their are always librarys right? Have a reader built in to all cell phones is inevitable. Many phones can already read HTML and surf the internet. Who wants to read a book on that small of a screen? You can do it, but who wants to right? I can if I have to. Imaganie that everyone has access to some kind of reader, all they have to do is go to the store, browse the "magazine" and "book" shelves for what they want. Find it and download it right their in the store. Users could hook up to a port right there or a wifi hotspot, enter in a store code, etc. and they just bought the book/magazine from that store. Many kindle books are sold at a reduced rate compared to the print edition because there is no cost in printing. Great deal for the buyer and it reduces the use on our natural resources. Peraps though, (playing devils advocate here) that it will increase our demand on energy. But perhaps it will take even less energy to download the files and power our digital readers than it will to cultivate the paper, process it, print it and dispose of it when we are finished reading. Hmm, something to think about any way. Do you have children in school? Are you a college student? Do you have several giant heavy books? Do they cost every year? What do they cost a school system to maintain and to keep up to date? What is the cost to a school to buy a reader every year, give it to a student to use for a few years and download their books into the reader. Now the student has one book to carry around, to rememebr, to keep up with, and to maintain. Need the latest version of the book? Download it. What do you do with the old version? Delete it. Where does the waste go? There is no waste. Is this a different idea? Sure. Would it take some time to get used to? Absolutley. Is it a good idea? I think it warrants taking a look at any way. What do you think? Is going digital a good idea for a school system? Do you already pay book fees at your school? Do they cost as much as a new kindle stretched our over a few years (2 or 3)? Would you be willing to try it? Why would this be a bad/good idea? We all see things differently. It's a matter of taste. As with all tings AutoCAD, all things are customizable. So are the colors of nearly each item in AutoCAD. One of the most common questions I receive here at CAD-a-Blog about AutoCAD is "How do I change the background color?" It's a good question. It is one of the first things I do when I load AutoCAD on a machine. I can't stand the white background. 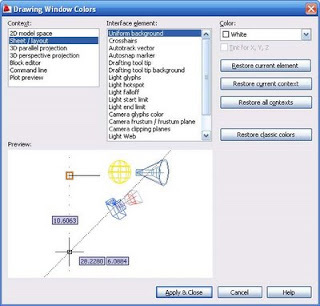 To adjust the colors in AutoCAD, open the OPTIONS window. Type in OP at the command line to start the OPTIONS window. On the left of the window, near the center, there is a button with text in it labeled COLORS. Click it to edit the colors of AutoCAD. This will open the color settings. On the left side of that window, under the CONTEXT area, click the SHEET/LAYOUT option. This will bring up (on the right) the options that you can change for the layout/paper space area. In the center of the window is the INTERFACE ELEMENT option. Pick the UNIFORMED BACKGROUND. That is the background. On the right, top, under COLOR, (obviously I guess) is where you pick the color. Once you find the right button to push, and where Autodesk has hidden it!!! it's a rather easy thing to change.